This matching necklace and pair of earrings are inspired by dark grey clouds, a celebration of British weather romanticised in jewellery. Featuring droplets of labradorite and kyanite gemstones wrapped onto the spiralling copper wire work frames. 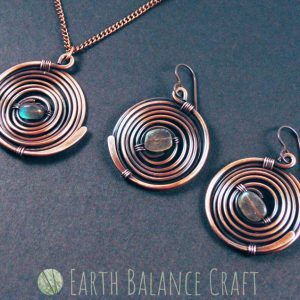 This matching jewellery set is hand-made with oxidised copper wire work and labradorite gemstone rain drops. With a minimalist feel, the design celebrates the dreary British weather, grey clouds and rain drops are part of daily life. The pitter patter of rain drops have been captured in this matching pendant and earrings set. Featuring grey labradorite rain drops and delicate copper wire work. Celebrating the best of spring time British weather.